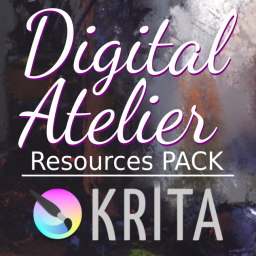 Check out all of the Krita merchandise and training material! 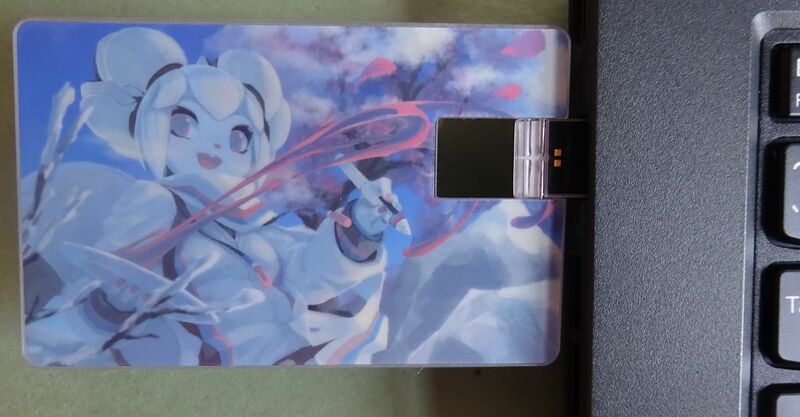 All proceeds go to support the development of Krita. We are located in the Netherlands, Europe. We sell through Gumroad because that’s currently the best way to handle VAT in Europe. This unfortunately means that the prices listed here are excluding VAT, since the VAT is different in every country. Physical orders: we use standard postal delivery. Depending on your location this can take between a couple of days and several weeks. USB keycard with the newest stable version of Krita for all OSes. 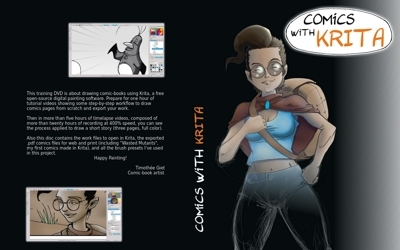 Includes Comics with Krita, Muses, Secrets of Krita and Animate with Krita tutorial packs. USB keycard with Krita 4.1.1 for all OSes. 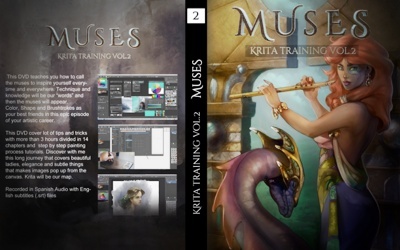 Includes Comics with Krita, Muses, Secrets of Krita tutorial packs and Animate with Krita tutorial packs. Aa complete new brush preset bundle: Digital Atelier. Not only does this contain over fifty new brush presets, more than thirty new brush tips and twenty patterns and surfaces, there is two hours of in-depth tutorial on creating brush presets. Now just €14,95, from €29,95. Comics with Krita author Timothée Giet is back with his second training DVD: Secrets of Krita. Ten chapters covering topics like brush settings, layer handling, transformations and more! In depth and in detail. The DVD is English spoken with English subtitles. Read more about it! Five hours of detail-packed instruction, covering the whole process from setting up Krita to printing a finished work of art. The DVD isn’t just about using Krita’s interface. It’s a complete creative course. The video is Spanish spoken with English and Spanish subtitles. 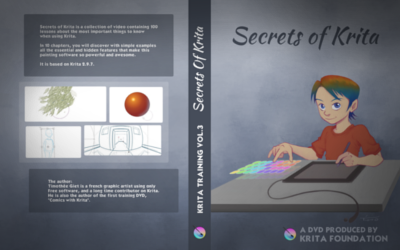 Comics with Krita author Timothée Giet is back with his second training DVD: Secrets of Krita. Ten chapters covering topics like brush settings, layer handling, transformations and more! In depth and in detail. The DVD is English spoken with English subtitles. Read more! Krita’s exciting new animation feature explained by Timothee Giet! Krita 3.0 and up comes with tools to create traditional hand-drawn 2D animation. Create the next Looney Tunes with Krita! This is a preview release, containing two of three planned parts. Everyone who buys now will receive the third part when it is ready. The first part explains the user interface and tools, the second part explains the principles of animation. The third part will showcase creating an animation from start to finish. Read more about this training course! By popular demand. the first training DVD is again available. You could also torrent the DVD or watch it on Youtube, but by buying it, you support Krita development! Timothée Giet shows you how to use Krita and Scribus to create comics with only free software. Do you want to become a better game artist? To learn how professionals make beautiful sprites? 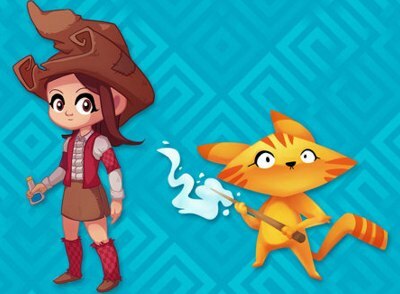 In this workshop, I will show you how to create your own game assets using Krita, a powerful, free and open source painting program. The link will take you to GDQuest’s Gumroad shop page. Do you want to become a better game artist? 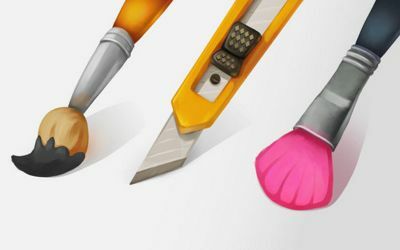 In this workshop, I will show you how to create your own game assets using Krita, a powerful, free and open source painting program. I’ve been in the games industry for a few years now. I made my own indie game company, worked on mobile and browser-based titles. The link will take you to GDQuest’s Gumroad shop page. 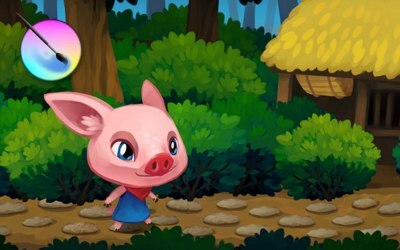 Learn how to create character sprites for games with a cartoon or cel shaded art style! In this short course, I will show you some special tricks I found to create cartoon characters fast. We will look at the specifics of making cell shaded sprites for games, but everything you will learn applies to illustration. The link will take you to GDQuest’s Gumroad shop page. 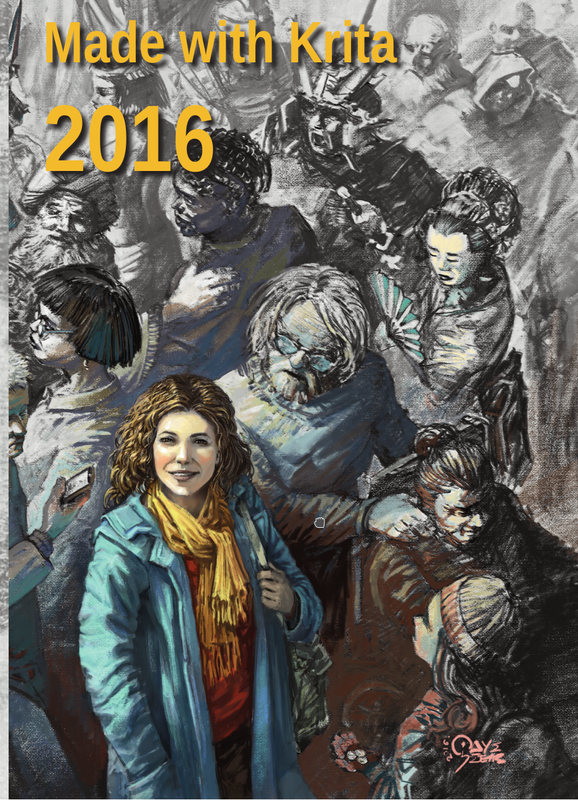 You can now also get Made with Krita 2016 as a download! You will get three pdf files. A separate file for the cover and contents, suitable for high-quality printing, and a lower-resolution file, suitable for reading on a tablet or computer. When does shipping happen? If we receive your order before 16:00 CET, we will send it out the same day, otherwise it’ll be the very next day. What days of the week do you process orders? Monday through to Saturday, except for holidays and the occasional vacation. Where do you ship to? Everywhere. We ship with ordinary post, not a courier, so there’s no tracking information. If you need tracking information, mail foundation@krita.org and we can figure something out. Some countries have a more reliable postal system than others.